Annual Mata Hinglaj Yatra in Pakistan is taken to the mountain cave Hinglaj on the Makran coast in the Lyari district of Balochistan. The annual Mata Hinglaj Yatra and Mela in Pakistan will be observed on the first fortnight of April. Goddess Hinglaj Ma is an incarnation of Goddess Shakti. A mela or fair is organized on the occasion. The popular belief is that when Lord Vishnu cut the body of Goddess Sati – to stop Shiva’s lament after Sati’s death – part of her head fell at Hinglaj or Hingula. Thus this is one among the 51 Shaktipeeths. The annual Hinglaj Mata yatra and mela is conducted by the Hinglaj Seva Mandali (HSM). 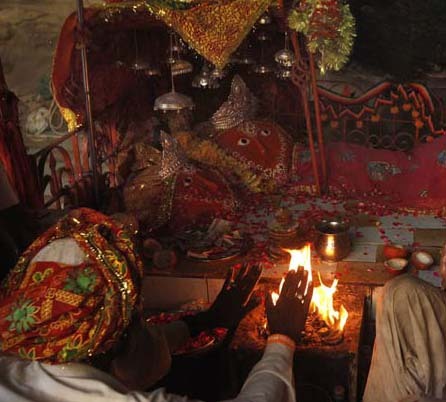 In India, Hinglaj Mata is widely worshipped in Gujarat, Rajasthan and parts of Maharashtra.